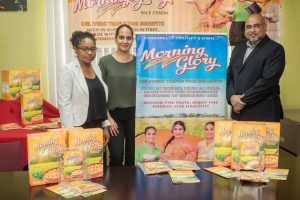 After more than six months on the market, the local rice cereal ‘Morning Glory’ has recorded sales ranging from $30Million to $35Million. On Wednesday, ANSA McAL Trading Limited (AMTL) in collaboration with Guyana’s Institute of Applied Science and Technology (IAST) officially launched the cereal at the AMTL head office. In brief remarks, AMTL’s Food and Consumer Goods, Manager, Anjeta Hinds said that the company is happy to have been entrusted by Dr. Suresh Narine, Director, IAST to promote the cereal which is well on its way to becoming a staple in Guyanese households. “We (AMTL) thank Dr. Narine for partnering with us and allowing us to take his ‘baby’ to develop it as a staple, as a breakfast cereal and nutritional value-added product into the market and into the homes of fellow Guyanese,” Hinds was quoted as saying by government’s Department of Public Information. She noted that AMTL is known for providing products that are in great demand, hence the decision to do the same for a local product. The cereal is known for its use of locally grown rice from Essequibo, the use of organic and nutritionally beneficial products like molasses and other vitamins and minerals. In 2017, IAST commissioned its long-awaited rice-cereal plant at Anna Regina on the Essequibo Coast. The factory currently employs approximately 22 highly trained staff members of IAST. The manufacturing process is of the highest quality and standard and is comparable to any operation in the developed world. The plant has the capacity to produce 1 tonne of the cereal within a five-hour period. Dr. Narine noted his satisfaction to have been able to partner with AMTL a known distributor of quality products which he said which fits well with the image ofMorning Glory and what it represents for the country. “We think of their partnership with us as an endorsement of the level that Morning Glory has achieved since we know the company only distributes quality products. Anyone can make a thing but it takes a tremendous amount of effort, dedication and focus to make it good. We would like to think that Morning Glory is a great thing,” the director said. He encouraged members of the public to try the cereal and compare the taste, texture, packaging, nutritional value and general appeal of the Morning Glory rice cereal, to other imported brands. “We believe that this product is an example of what Guyanese can do when we focus our collective efforts and what we can do when we inject national pride into the product,” Dr. Narine remarked.